Will Judge Kavanaugh Be Confirmed to the Supreme Court? The I Ching Weighs In. It seems the whole country is now caught up with this burning question, one that should be resolved with the Senate vote on Saturday. The nomination process – intensified by the recent allegations that Brett Kavanaugh committed sexual assault at least once when he was in high school – has divided Americans so deeply that it seems like everyone has taken a side and dug in. Full disclosure: I, too, have taken a side. I want this nomination to go down in flames, and what he may have done to Christine Blasey Ford and other young women is only a small part of my rationale. Regarding the allegations, I agree with the Democrats that the FBI investigation was probably insufficient, and with the Republicans that without corroborating evidence, this really is an instance of he said, she said. Instead, I’m concerned about adding another conservative vote to the court that will tip the balance. And I’m especially concerned that he appears to advocate for greater powers for the President, as well as immunity from prosecution when that person is in office, and I’m thinking that is probably why he landed on the short list for this nomination to begin with. He wasn’t on the previous two lists of potential nominees given to Trump, but now with the Mueller investigation closing in, Trump needs a defender more than ever. I also hated his comportment during last Thursday’s public hearings – how he ranted and interrupted the Democratic senators, how he denigrated the whole process while loudly proclaiming his unequivocal innocence. He even tried to deny he was much of a teen drinker, even though such a confession would probably have been viewed as fairly benign in these circumstances. To me, he came off as a bully, and a dishonest one at that. Given this bias, I’m sure some of you would expect me to announce that the I Ching affirmed my heartfelt, almost desperate, wish regarding the outcome of Kavanaugh’s nomination. But this is what makes the oracle so great: it is not a mirror of your thoughts or wishes, and the process for casting a reading does not seem to be subject to unconscious manipulation. While it is true that some readings are so puzzling that you can project your desired meaning upon the text, the reading I received for this question allowed for no doubt or tricky interpretation: Brett Kavanaugh will be confirmed. What is the likelihood that the Senate will vote to confirm Brett Kavanaugh’s nomination to the Supreme Court? What is the likelihood that the Senate will vote to not confirm Brett Kavanaugh’s nomination to the Supreme Court? Will Kavanaugh be confirmed? Hexagram 16 (title: “Enthusiasm”*) changing to Hexagram 2 (“The Receptive”). Generally, Hex 16 discusses favorable conditions and energy moving in the seeker’s direction. There was 1 change line, in the fourth position. A part of the original text of that line reads: “One’s will is bold enough to fulfill great aims.” Another reads: “Great accumulation obtained.” However, the line does advise the reader to not be “suspicious.” That could either be interpreted as a warning to me that he won’t be as damaging to the court as I think he’ll be, or an advisory to Kavanaugh that allaying suspicion – both his and the liberal public’s – will be one of his challenges as he settles into the court. Instead, his charge will be to gather others, to seek out connections and work to the greater good. Hex 2 is pure yin, symbolizing Earth, and heavenly manifestation of events on Earth initiated through the action of Heaven, while also indicating that friends will be won and lost. Will Kavanaugh not be confirmed? Hexagram 52 (title: “Keeping Still”). Does that say it all? This position is a non-starter. Last week I was honored to be a guest on Dr. Bernard Beitman’s “Connecting with Coincidence” radio show which will be aired with affiliates over the XM Broadcast Network. 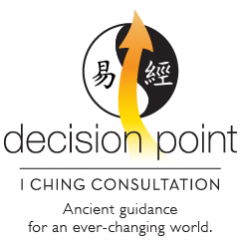 Among other topics, I describe how the I Ching can support decision making that is in sync with the unique confluence of factors that are at play at the moment you are asking your question.